When you're out on the open road behind the wheel, you are sending a messages to everybody around you. People driving next to you or walking their labradoodle on the sidewalk are passing judgements based on your which car you have, how clean it is, what color it is, how you drive, and what you look like when you're driving. For example, if you're driving a rebuilt 1969 Chevy Camaro, people will respect your excellent taste and probably be impressed that you were able to restore an old beauty. If you're a man driving a bright yellow PT Cruiser woodie, however, people might look at you like you just threw up on yourself. 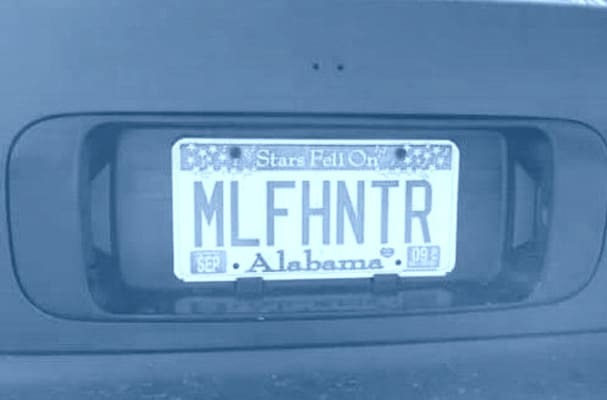 Now, if you're really trying to convey a message with your car, there is one definitive way to do so: your license plate. You can spell out whatever you'd like within the character limits. It's like the shortened automotive version of Twitter. Some choose to display school pride, some celebrate what car they are driving, and others, like the ones you are about to see, say ridiculously shocking things you'd never expect. From "TBAGGR" to "ISWALO," check out our gallery of 30 Ratchet License Plates.